Moving to a new property is an exciting prospect, particularly when the garden has been neglected for some time. Previous owners may have planted productive fruit trees that have fallen into neglect by subsequent occupiers. Overgrown fruit trees, when neglected, grow tall, tangled and produce poor fruit. The inner branches are shaded, leading to dead and decayed wood. Cultivated trees are more susceptible to disease than their wild forebears. When faced with the prospect of dealing with overgrown trees, new owners are inclined to solve the problem by removing them. As we know, fruit trees are an asset and should not be removed if there is a possibility of returning them to a productive state. We can do this with a combination of pruning, fertilising and disease control. 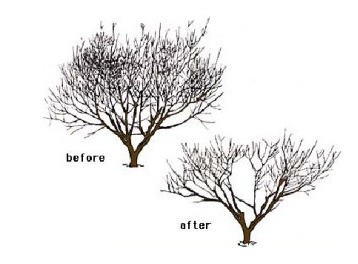 Trees should be pruned in late winter or early spring, before growth starts. No more than a third of the tree canopy should be removed at one time otherwise energy may be diverted to ‘suckering’ rather than tree growth. First of all, damaged, dead and diseased wood should be removed and cut back to ‘live’ wood. Note the advice given on branch removal. Cut surfaces can be treated with a sealing product. The best shape to achieve is that of a bowl, i.e. branches radiating from the trunk with the centre open to let in light and air. Horizontal branches should be cut back so that, when weighed with fruit, will not touch the ground or lower branches. Tall trees must be cut back to a manageable height. If trees have been neglected for a very long time, it is better not to return them to the desired size in one drastic pruning. Plan the activity in stages to last two years or more. Neglected trees may produce little growth due to lack of soil nutrients. Nitrogen rich fertiliser encourages new growth and should be applied in late spring. Too large an application will result in excessive growth. Remove completion by cutting weeds and grass and applying mulch. Pests and disease affect both growth and fruit production. Make note of damage to fruit and wood, identify the cause and decide upon a programme of control. Remember that rejuvenation is not a rapid process and trees may not produce any fruit in the first year but will be effective after a few years.